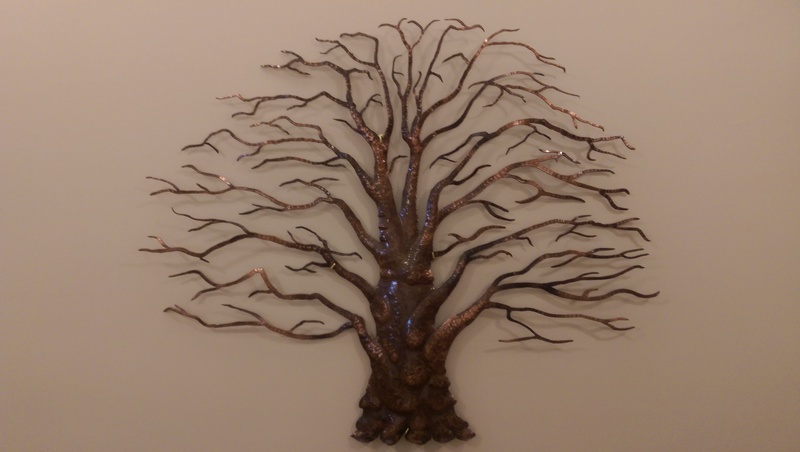 SyctreeCloseup: Water-jet cut & hand hammered 72-ounce copper sheet. 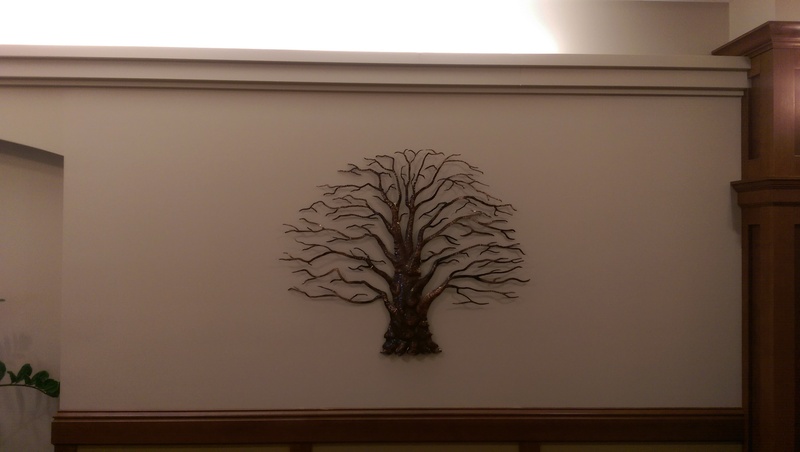 SycTreeWall: Main hallway wall on which the piece is mounted. 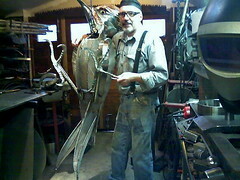 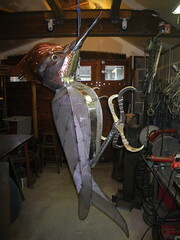 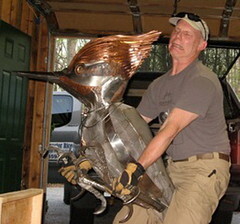 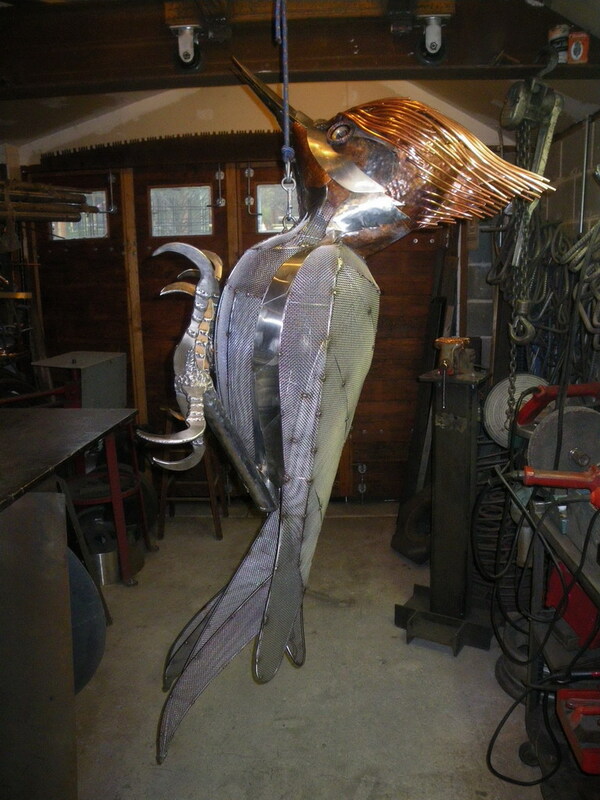 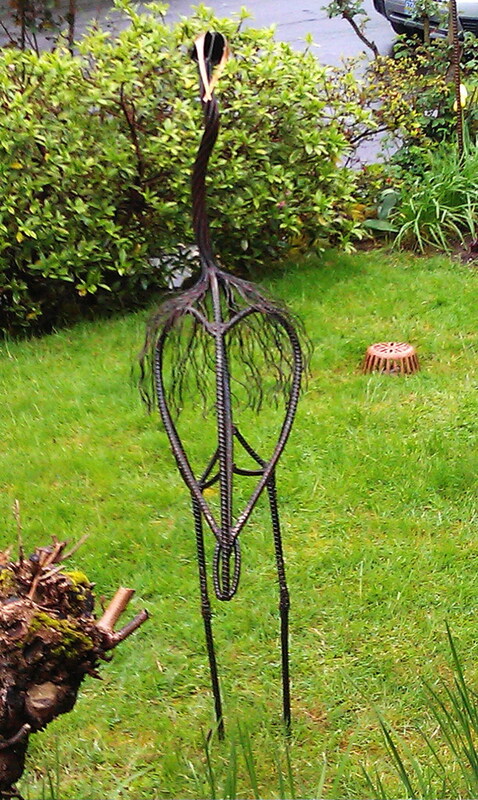 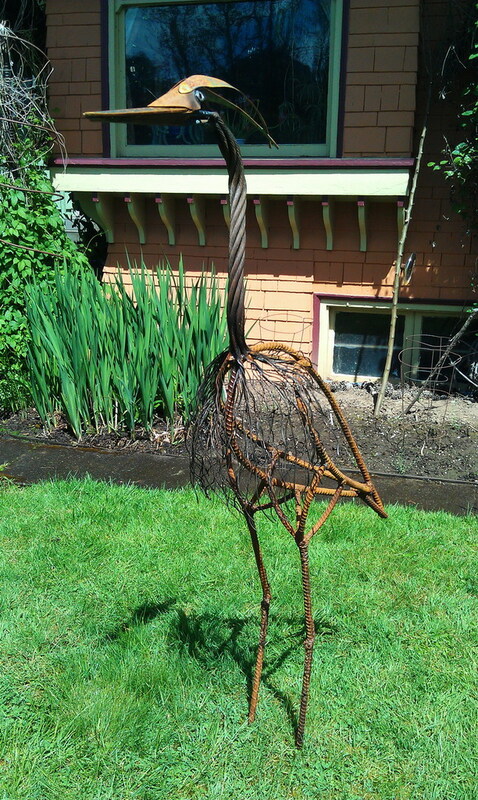 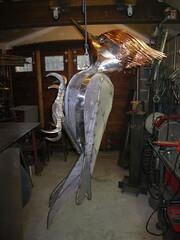 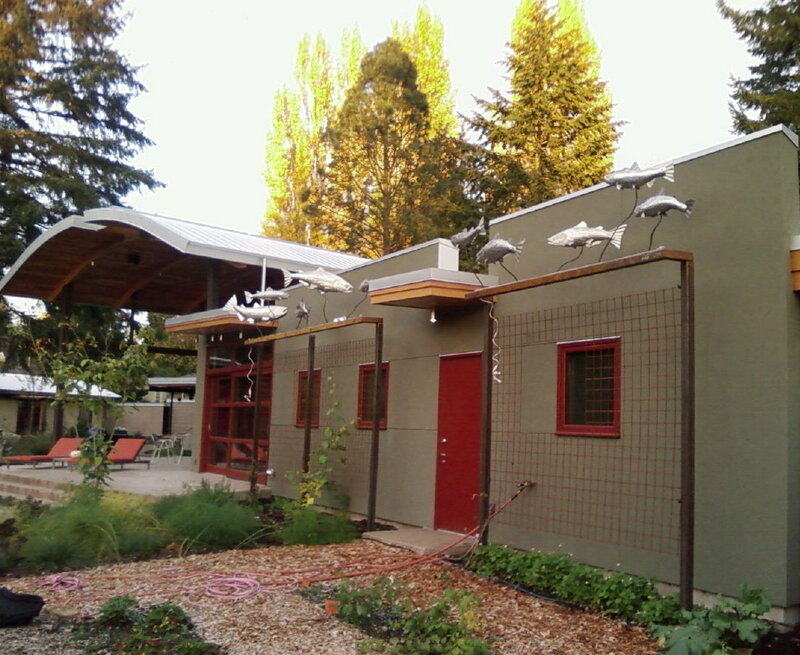 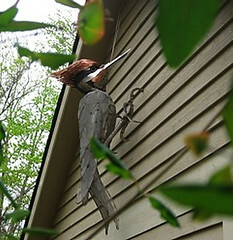 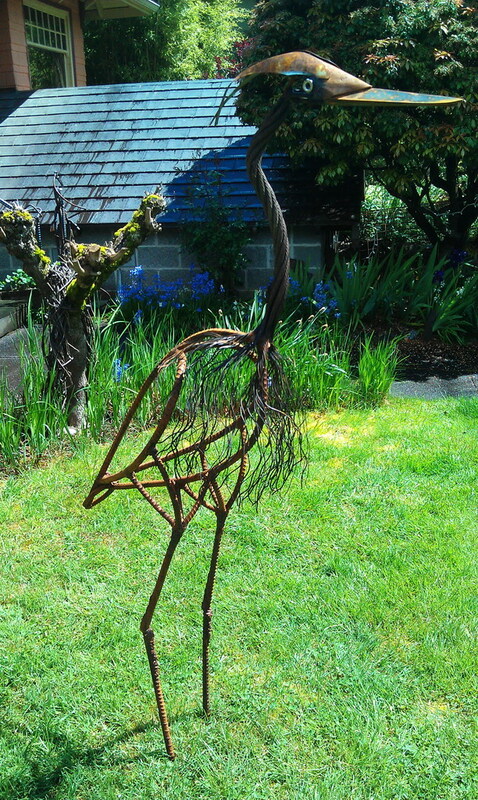 GBH Final Rt: 5.5'-tall Great Blue Heron: Used mainline logging cable, 5/8" re-bar, and mild steel. GBH Final Lt: This bird is wading in about 6-8 inches of lawn. GBH rear: View from the rear. 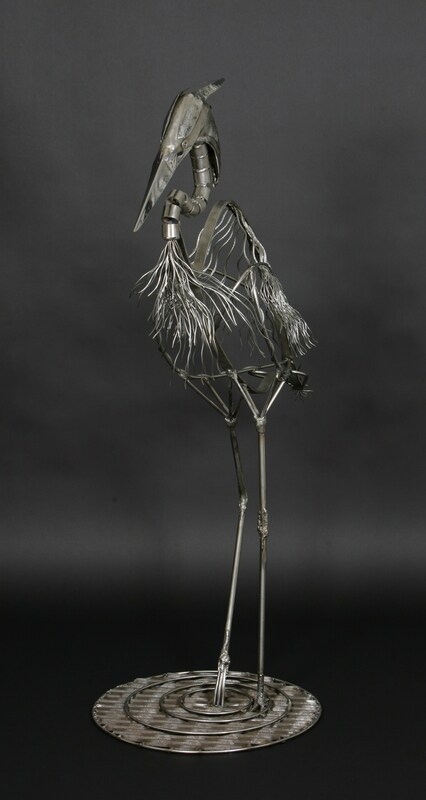 I'm happy with the gracefull movement I achieved in this piece. 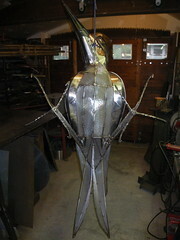 Meet my friend: Stainless steel wire mesh feathers keeps this bird on it's toes. 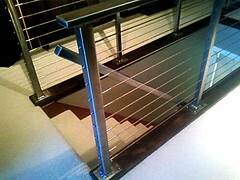 Stair & Guard Railing: Sturdy with a tidy look. 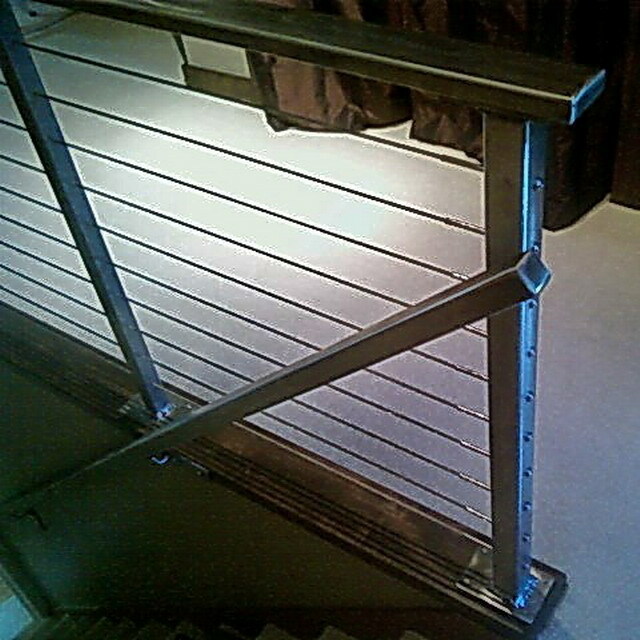 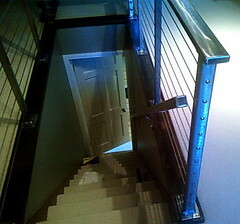 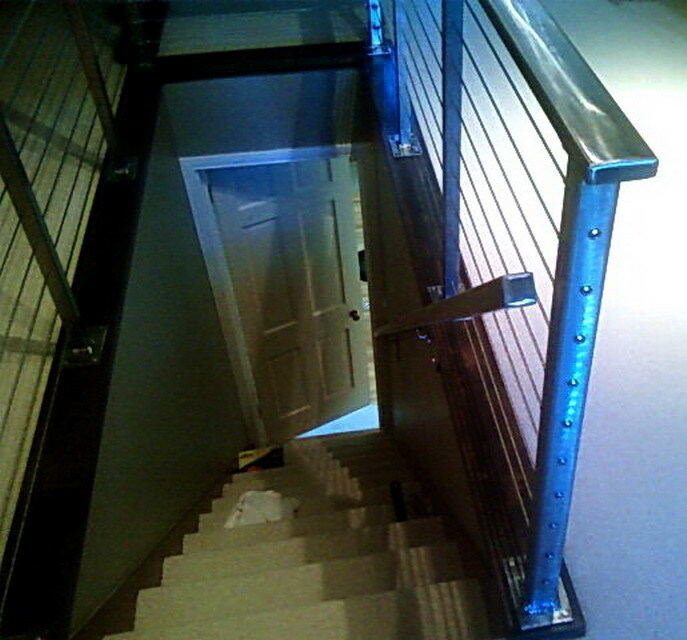 Stair Railing: Complete custom stainless steel stair hand and guard railing. Trellis1: The supports are three #11 (1-3/8") re-bar, 12' long with a 53-degree bend at 7'. The mesh is 4" by 4" number 6 concrete re-enforcement steel, framed by 2" by 3" by 0.875" box-tube steel 20' by 3'. trellis2: The client plans to grow either hops or scarlet-runner beans. 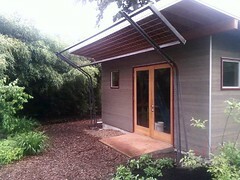 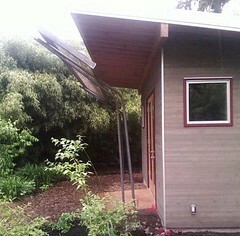 trellis3: This was a challenging project for alignment and weight reasons. 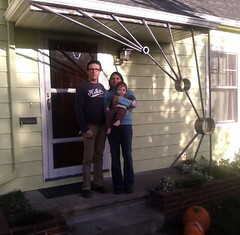 I got by with a little bit of help from my friends while building and installing this trellis. 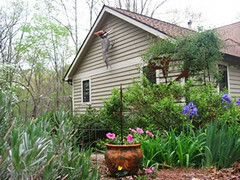 Front Porch Art: The one inch-thick re-bar is caneleavered from a sequence of mild steel pipe remnants to support the porch roof while providing interest. 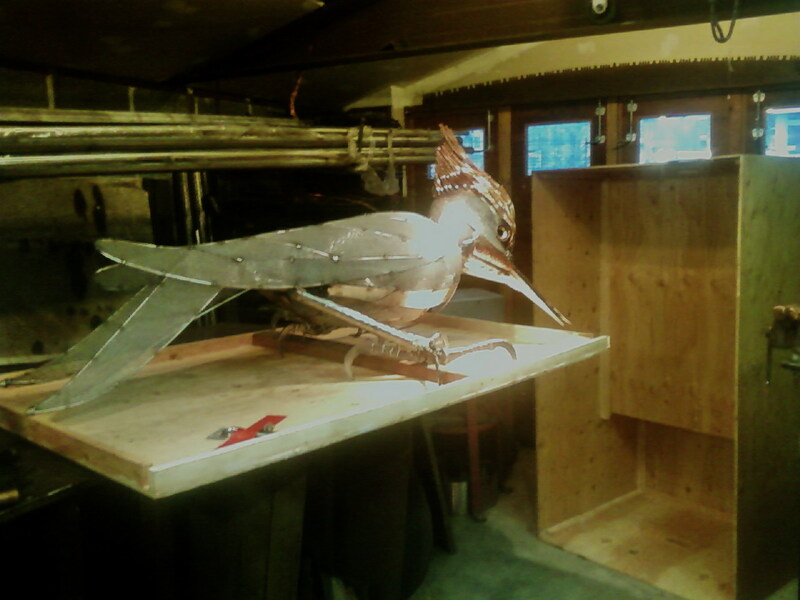 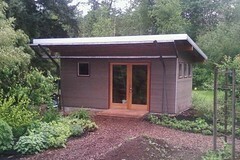 The owners will let the structure rust to an orange-brown color before I seal it with a clear coat finish. 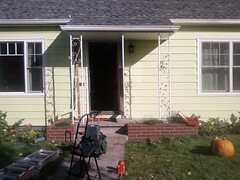 Front Porch - Before: The 1050's style supports were bland and the left one blocked the left-side entry into the house. 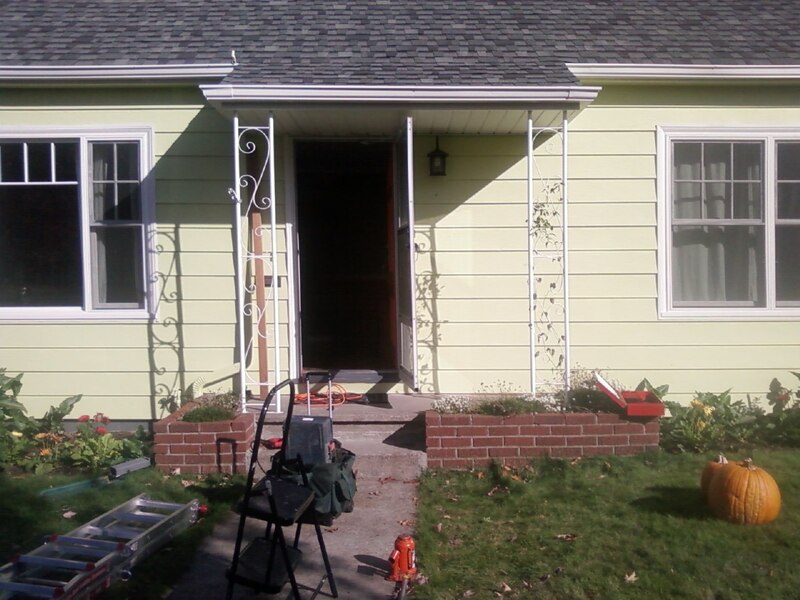 Our New Front Porch: The new structure has an artistic flare and opens up the access into the house for the new owners, who celebrated their fist anniversary owning this cute Cape Cod-style house. 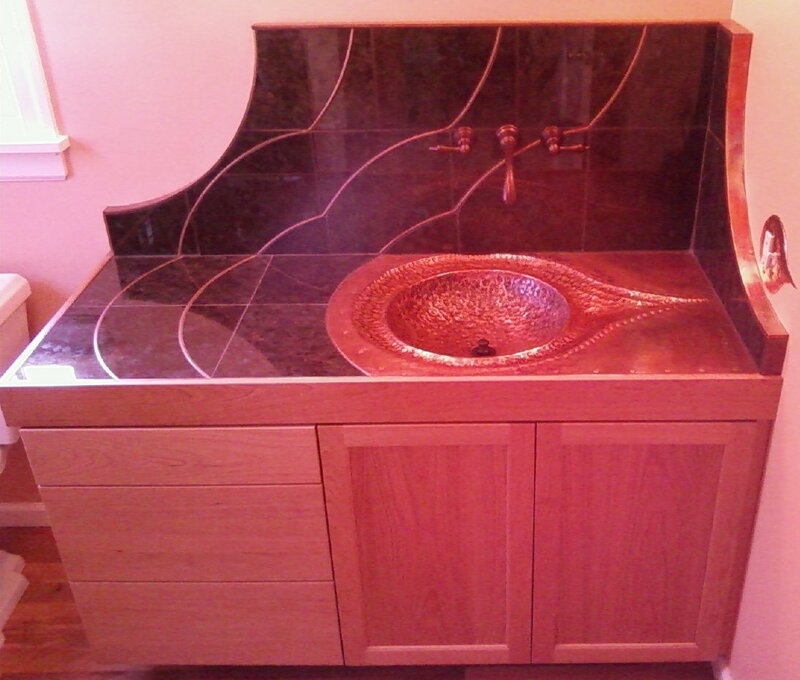 sink fin straight: Completed copper sink installation with granite tile and copper inlay. sink from shower: View of sink from the shower. 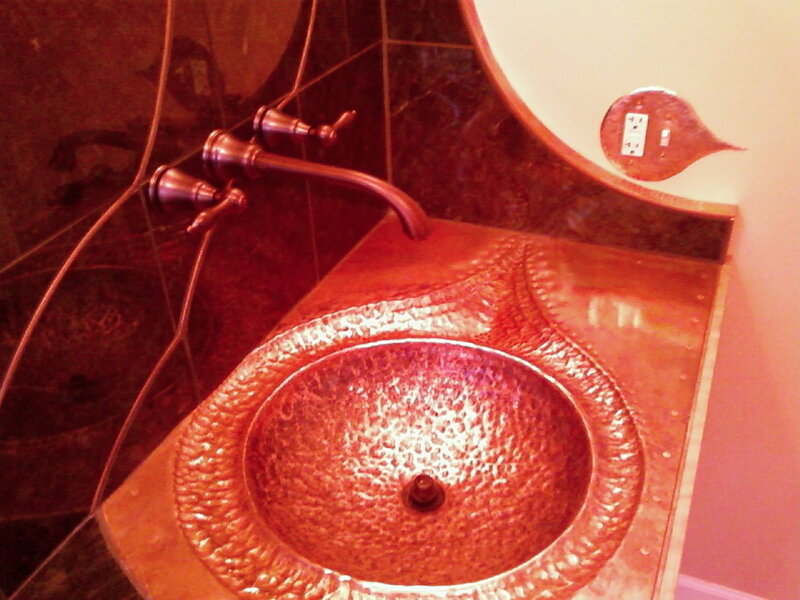 sink closeup: Closeup of sink and fixtures with copper switchplate on the wall. 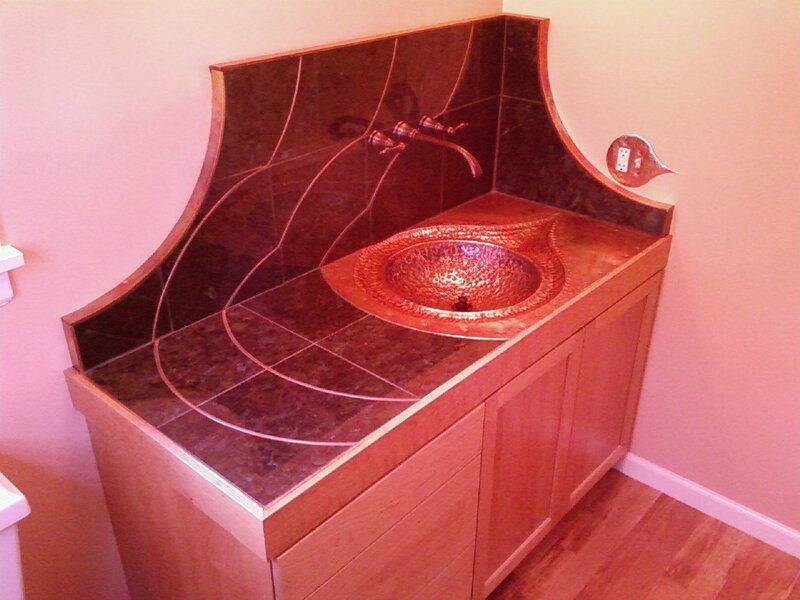 When plugged, the sink basin will overflow at the bottom of the picture into the outer ring. 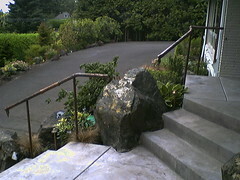 The water flows around both sides (front and back of the outer ring) and drains into the "tail" depression at the right side of the ring. When both faucets are fully open, water does not overflow the outer ring. 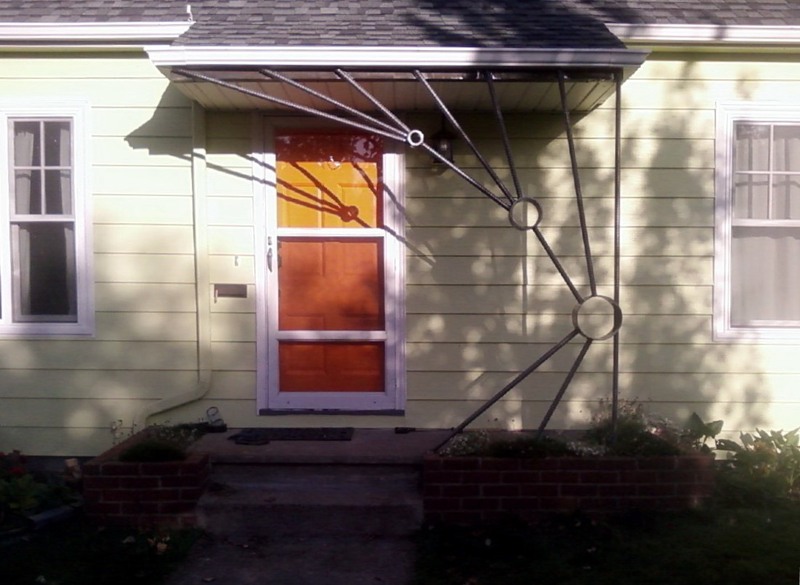 Analemma3: Stainless steel analemma marker, 30" x 32" and 9' high facing south. Analemma2: Stainless steel analemma marker, 30" x 32" and 9' high facing south. 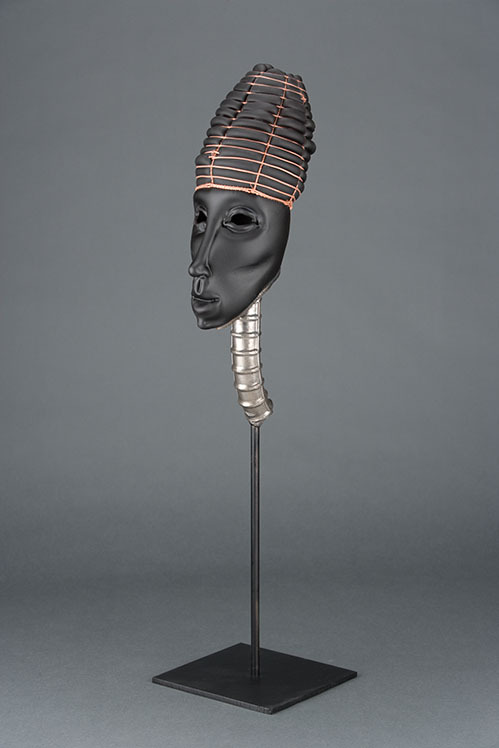 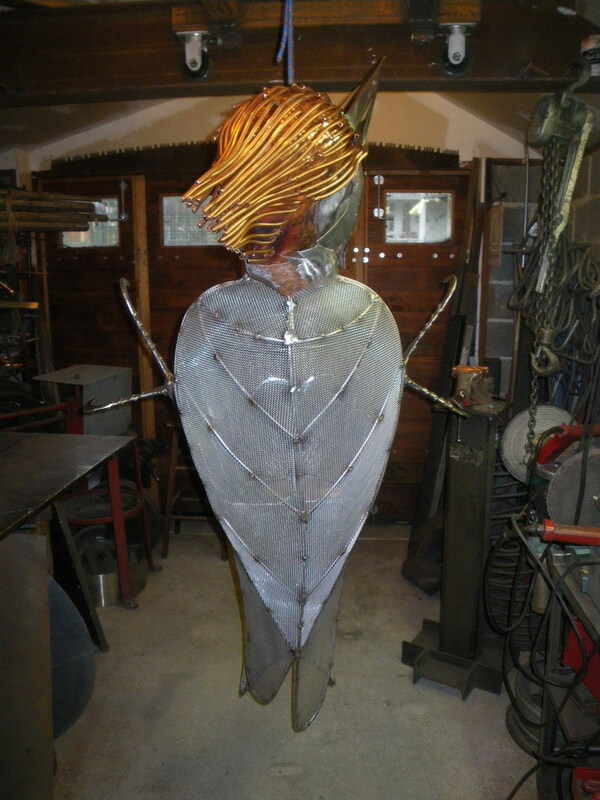 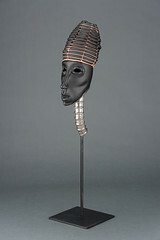 Karen Mahardy/Jeff Jenkins collaboration: Karen created this hot sculpted glass and copper mesh head, to which I added a #32 re-bar neck and stand. 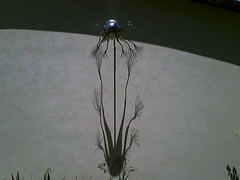 Analemma1: Solar calendar in late afternoon sunlight. 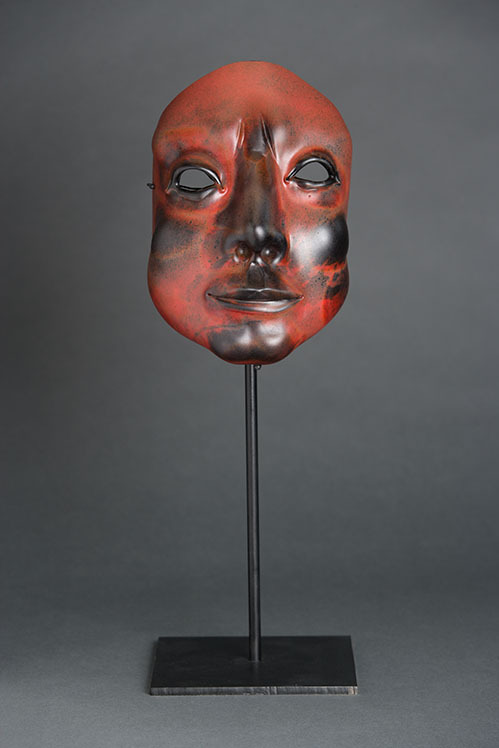 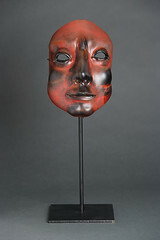 Glass Mask: Karen Mahardy created this life-sized hand-blown, hot-worked glass mask, for which I built the presentation stand. Migration: Stainless steel spawning Coho salmon with house numbers. 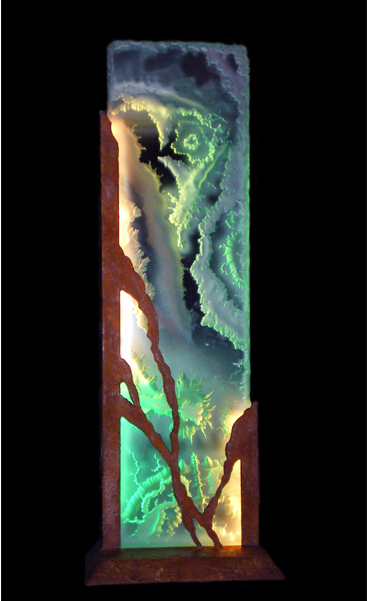 Meta-morph 1: Lawrence Morell's lighted glass and steel sculpture "Meta-morph" at the SOFA show in Chicago last week. I made the steel base/frame. 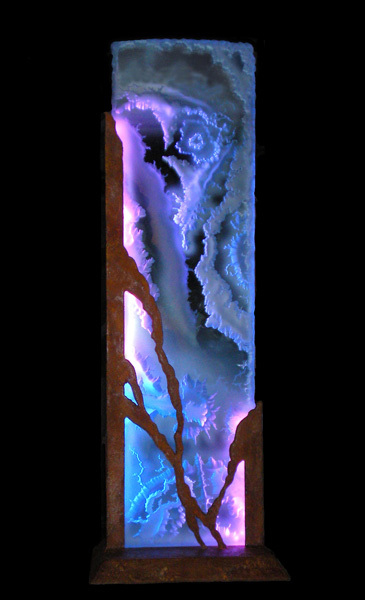 Mata-morph 2: LED's are installed between the steel sides and glass where they are programed to change colors slowly. 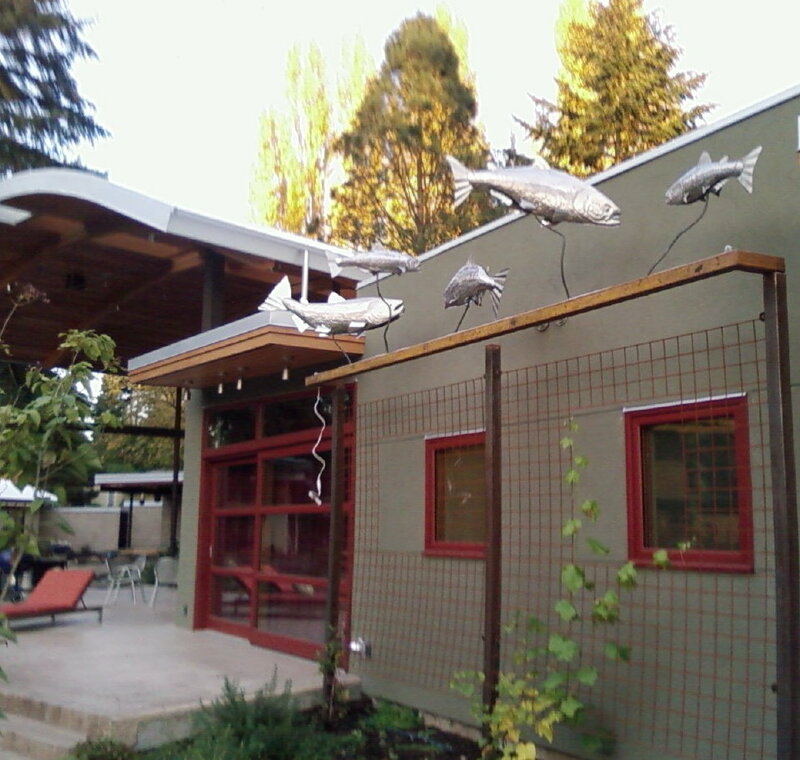 10 salmonids: This life-sized 10-fish school is made up of 3 Chinnok, 4 Coho, and 3 steelhead salmon, all stainless steel. 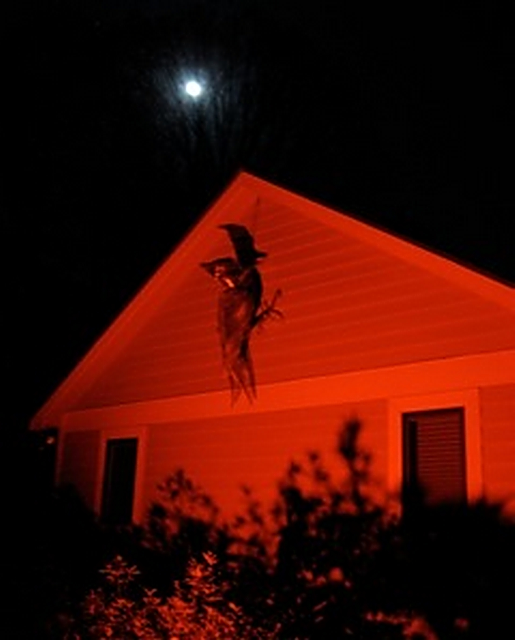 Weatherproof LED lighting runs along the top of the supporting cross beam, providing ambient achitechtural lighting at night. 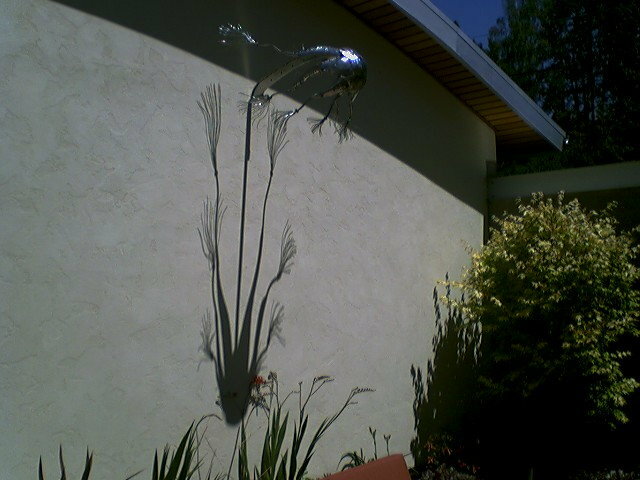 Shadows of the fish are cast on the wall by the late afternoon sun. 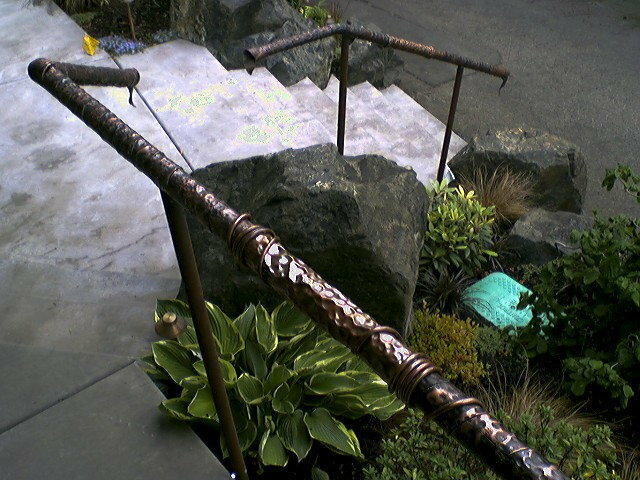 Copper-clad hand rails: 1/8th" x 2" copper bar stock wrapped around 1-1/2" steel round stock. 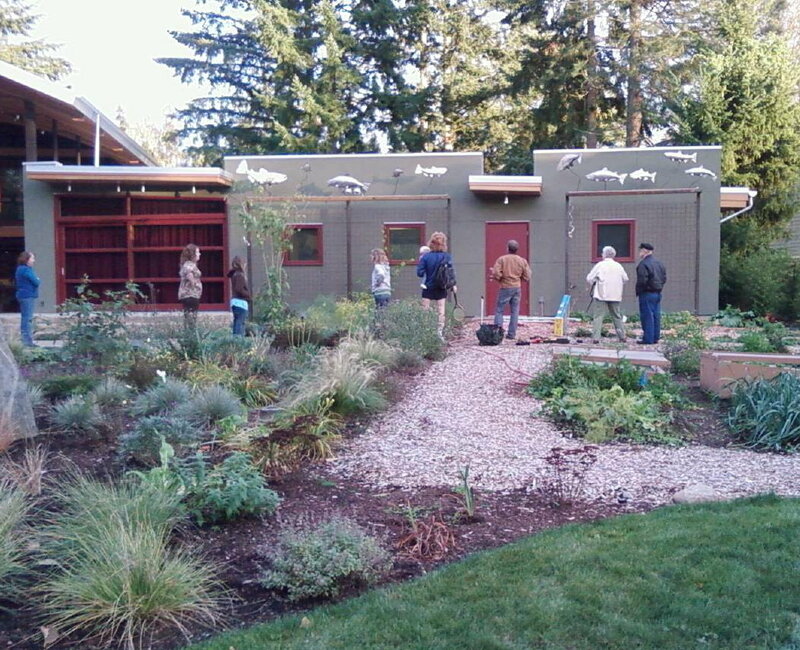 10 Salmonids @ angle: All ten fish rotate in the slightest breeze supported by half-inch re-bar above the vine trellis. 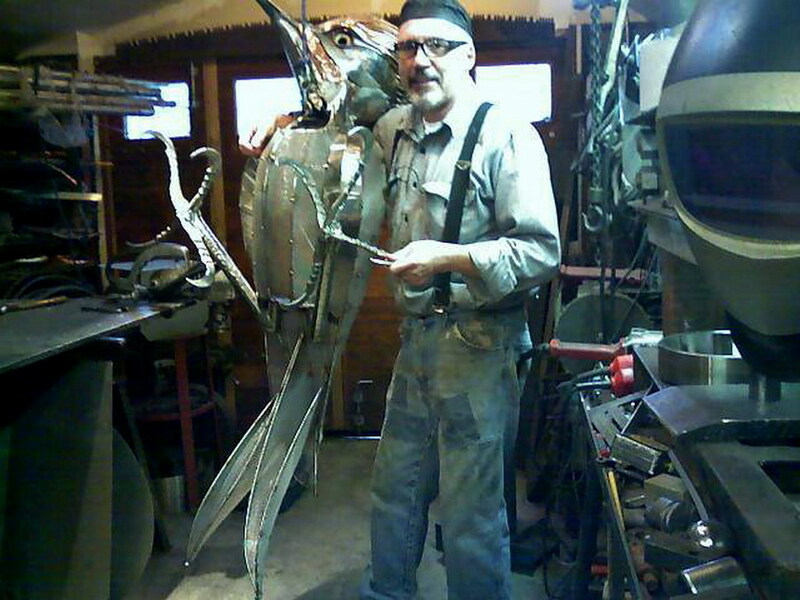 The patterns for the fish were borrowed from friend and fellow artist Eric Leonard of Springbox gallery. 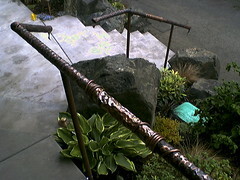 view from above: Copper railing detail. 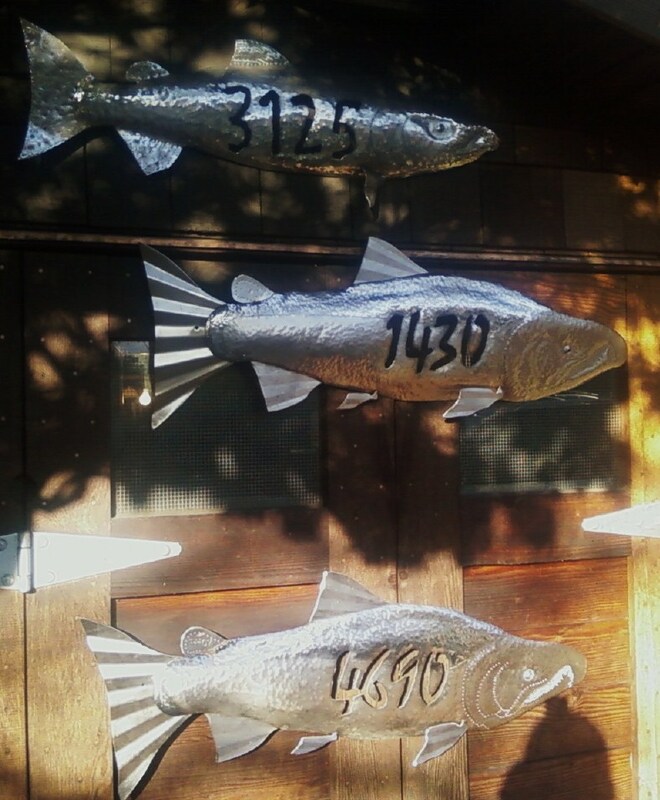 5 of 10 Salmonids: Closeup of 3 Chinook, a steelhead, and a Coho salmon (patterns borrowed from artist Eric Leonard). 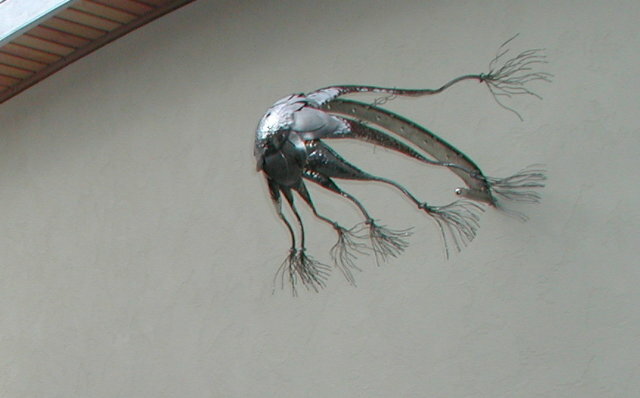 These fish rotate according to the wind. 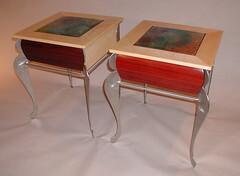 EndTables2: Colaborative effort with David Kellum (woodworking) and Martha Pfanschmidt (Bullseye glass artist). 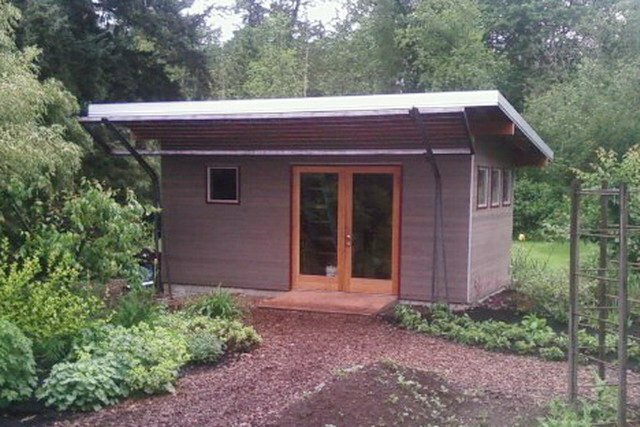 I designed and built the stainless steel frame and legs. 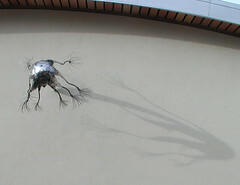 Analemma4: Eastern view of solar clock at noon 2-weeks after summer solstice. 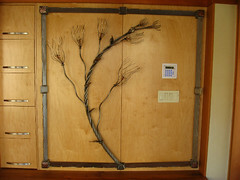 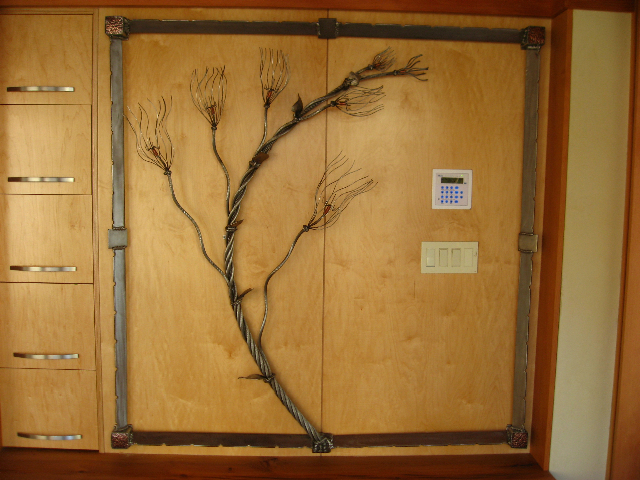 Coat rack: Stainless steel and copper coat rack, 5' x 5' x 6" deep. 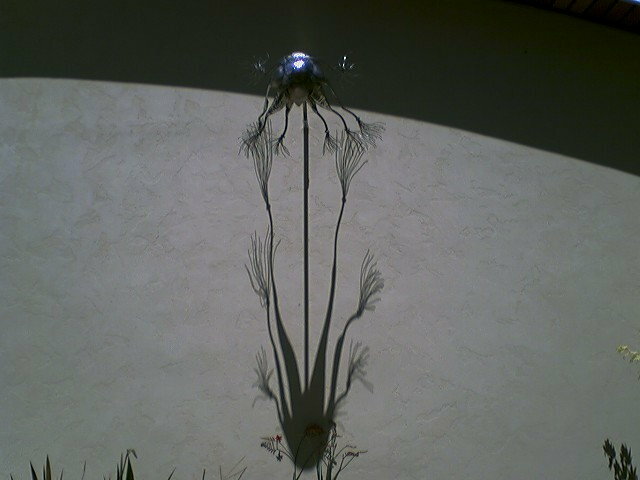 Analemma5: Straight-on view of solar clock 2-weeks after summer solstice at high noon. 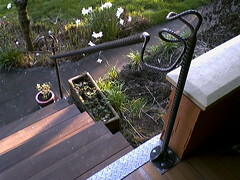 Handrail rebar1: Custom handrails made from recycled re-bar. Analemma6: Height of the analemma marker on the wall is 9' above ground. 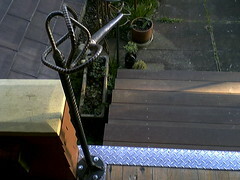 Handrail rebar2: Custom handrails made from recycled re-bar. 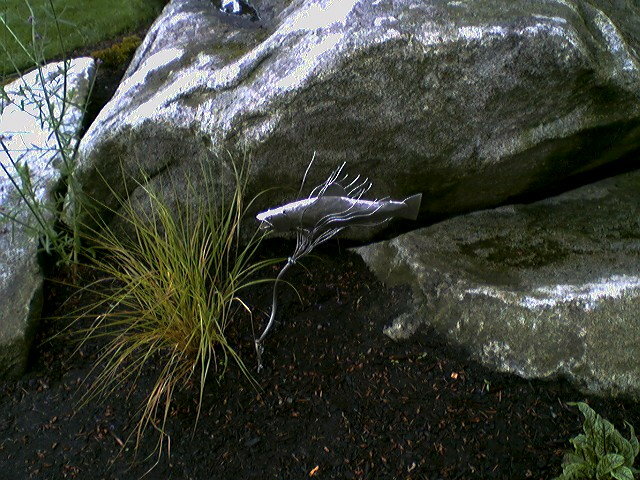 Garden trout: Stainless steel 15" trout holding in gentle current among bolders. 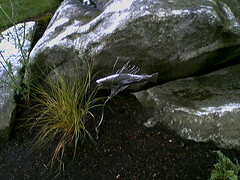 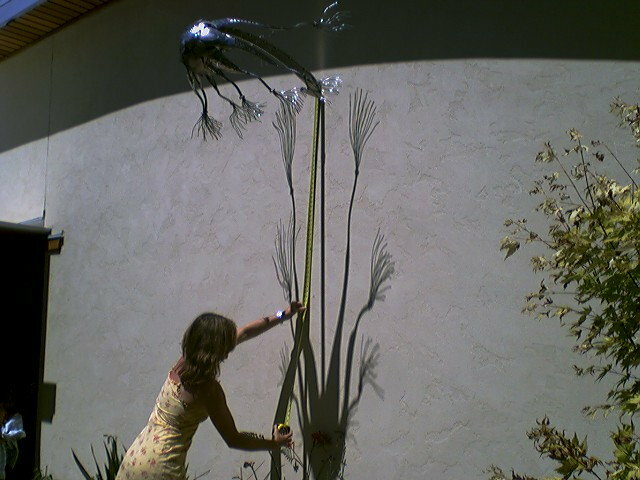 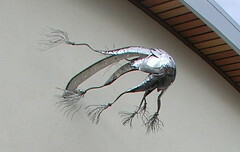 Two-pieces; fish and stainless steel water grass (22" tall). 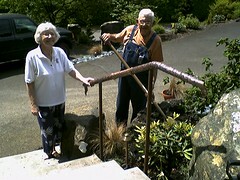 American Gothic with a twist: Clients with their newly installed "wrapped" copper handrailing.